With fewer than four months before the opening of Levi's® Stadium this summer, 49ers.com paid an important visit recently. 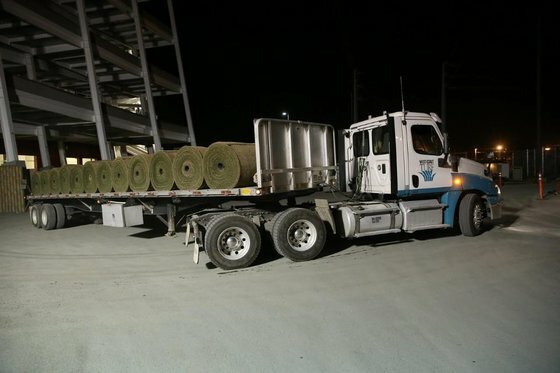 We ventured out to Livingston, Calif. in rural Merced County, where West Coast Turf (WCT) has been cultivating the field for the San Francisco 49ers new home. With the 49ers announcing their natural turf surface will be installed Thursday and Friday, the time is now to go deeper. Here are 15 things you should know about the stadium's grass. 1. The timeline: The roots were put down in the fall of 2012, grew rapidly in the spring of 2013, was selected by the 49ers over the summer and has been watched over closely ever since. "A little extra TLC," WCT manager Greg Dunn said. 2. WCT, which has offices in Livingston and four other cities, has supplied turf to seven MLB teams, including the Oakland A's and San Francisco Giants; three NFL teams, including the Oakland Raiders; the NFL for eight Super Bowls; and MLS' San Jose Earthquakes, which are also installing Bandera Bermuda in 2014. 3. The company's relationship with the 49ers officially started a few days before hosting the Dallas Cowboys in the 1992 NFC Championship Game. WCT replaced the wet, beat-up field with a thick-cut sod sporting an inch-and-a-half root so it would hold right away. 4. WCT also supplied the team with its sod over the years at Candlestick Park, but with a different variety. The average fan won't notice a difference between the Tifway II used at The 'Stick in 2013 and the Bermuda Bandera employed at Levi's in '14, but the experts will. 5. The 49ers chose this style of grass, in part, to help their players avoid injury. The team's sports turf manager and head groundskeer, Matt Greiner, said the grass type "has good tensile strength so when a player plants his cleat, it stays together." Dunn added: "It's our anticipation that you will have fewer players falling." 6. Greiner is "the best in the business," according to both Dunn and Jim Harbaugh. 7. The grass grower, Dunn, is a 49ers fan and takes "a lot of pride" in supplying Levi's® first field. "I probably turn on the TV and watch as a fan a little bit differently," he said. "I watch what's going on the field as they're interviewing somebody up close. I'm looking over their shoulder at what the field looks like. I'm looking at field conditions. I look at it much like Matt. My concern is player safety and just the quality of the game." 8. The two-day installation will require 106,000-plus square feet of sod, including including the playing surface, which is less than 70,000 square feet. Wednesday night, WCT will cut the sod into 42-inch strips and begin transporting 20,000 to 30,000 square feet of it on refrigerated trucks. The first truck should arrive by 5 a.m. Thursday. 9. Post-install, "the field is Matt's baby," Dunn said. "It wouldn't suprise me if Matt is mowing the field three to five days after the field is going down." 10. Bermuda Bandera is also known for its fast recovery rate after a lineman creates a divot and its ability to stay green deeper into the season. The latter advantage is a side effect of WCT over-seeding the sod with perennial rye grass last November. 12. Another advantage of Bermuda Bandera: It's greener for the environment. It requires up to 50 percent less water than the average turf variety in the Bay Area. 13. Harbaugh seemed to be joking that the grass field here would resemble the fairways at golf's Augusta National, the home of the Masters Tournament, but consider that the field was "formulated with a United States Golf Association or similarly engineered sand as the base upon which the sod is installed." There's also this: The Los Angeles Country Club's North Course employs the same variety. 14. Speaking of sand, the design of the field will faciliate water movement so that it will play as well come playoff time as it will during the preseason. 15. The field's first test will come Aug. 2, when the Earthquakes host the rival Seattle Sounders FC in the first sporting event in the stadium's history.